The Incan civilization was predominantly an agricultural society. 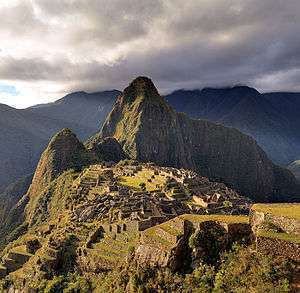 The Incas took advantage of the soil, overcoming the adversities of the Andean terrain and weather. The adaptation of agricultural technologies that had been used previously allowed the Incas to organize production of a diverse range of crops from the coast, mountains, and jungle regions, which they were then able to redistribute to villages that did not have access to the other regions. These technological achievements in agriculture would not have been possible without the workforce that was at the disposal of the Sapa Inca, as well as the road system that allowed them to harvested crops and to distribute them throughout their territory. 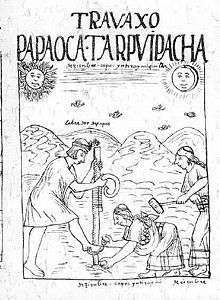 Illustration of Inca farmers using a chaki taklla, by Felipe Guaman Poma de Ayala, 1616. 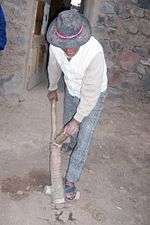 A traditional hoe still used by many small farmers throughout Peru. Chaki taklla, a human-powered foot plough that consists of a wooden pole with a curved sharp point, often made of stone or metal. Across the end of this pole ran another wooden crossbar, on which the farmer could put his foot to sink it into the earth and produce a furrow. 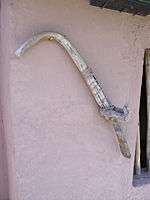 This tool is still used in the Andes for plowing, sowing, and building. Rawk'ana, a hoe with a thin sheet of wood of chachakuma, no higher than 40 cm. It was used to harvest tubers, to remove weeds and to sow small seeds. Waqtana, a Quechua term for a "clod buster"
The chaki taklla, rawk'ana, and waqtana were used by Andean farmers for thousands of years. The Incan agricultural terraces at Moray. The land was divided into three parts: one part for the aristocracy, another for the religious establishment, and the last for the farmers themselves, who were obliged to farm for all three groups. Among the staple crops grown were quinoa, potatoes, and maize. ↑ http://www.trophort.com/001/718/001718076.html Archived September 27, 2007, at the Wayback Machine. ↑ The Incas. Terrence N. D'Altroy. Blackwell Publishers Inc. 2002. pp 198-199. ISBN 0-631-17677-2. ↑ Earle, Timothy K.; Johnson, Allen W. (1987). The evolution of human societies: from foraging group to agrarian state. Stanford, Calif: Stanford University Press. ISBN 0-8047-1339-1. McNeill, W. H. (1999). "How the Potato Changed the World's History". Social Research, 66(1), 67-83. Kelly, K. (1965). "Land-Use Regions in the Central and Northern Portions of the Inca Empire". Annals Of The Association Of American Geographers, 55(2), 327-338. Maxwell Jr., T. J. (n.d). Agricultural Ceremonies OF THE Central Andes During Four Hundred Years of Spanish Contact. Duke University Press. (Spanish) Rostworowski, María: Enciclopedia Temática: Incas. ISBN 9972-752-00-3. (Spanish) Editorial Sol 90: Historia Universal: América precolombina ISBN 9972-891-79-8. (Spanish) Muxica Editores: Culturas Prehispánicas ISBN 9972-617-10-6. Rivero Luque: The use of the chakitaqlla in the Andes, 1987.